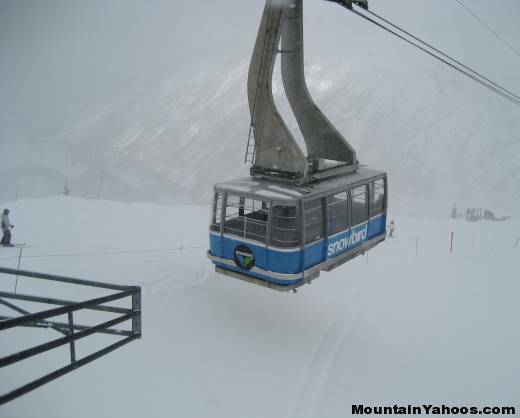 Snowbird, or "the Bird" as it is often referred to, is one of the premier ski resorts in Utah. The 29 mile drive from the Salt Lake City airport makes traveling to Snowbird easy. A direct morning flight from the east or west coast can have you skiing by noon! Although there is terrain for most skiers, Snowbird is definitely a ski resort expert skiers will enjoy. With an average snowfall of 500 inches annually, chances are good that most skiers will have great conditions and can ski most of the 2500 acres of skiable terrain with a vertical drop of 3240 feet. Snowbird's 10 chairlifts (4 quads and 6 doubles) and one tram (125 person capacity) take the skiers to any of the 89 trails. 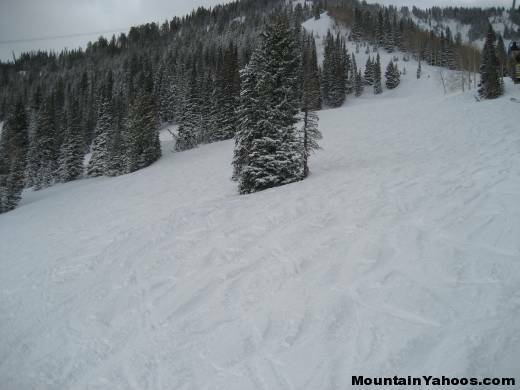 Snowbird's lift tickets are also relatively affordable compared to many other resorts. 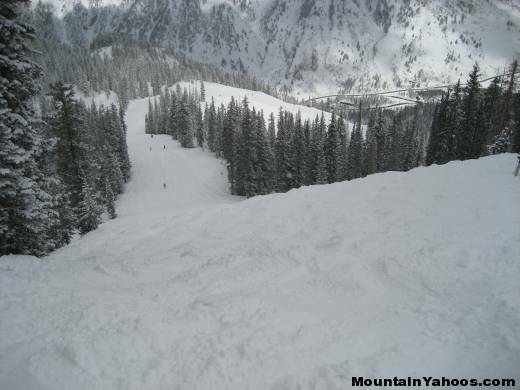 Snowbird is located South-East of Salt Lake City in Little Cottonwood Canyon next to Alta Ski Area. The snow in Utah is legendary for it's lightness, and many powder-hungry skiers come to Snowbird to satisfy their needs. 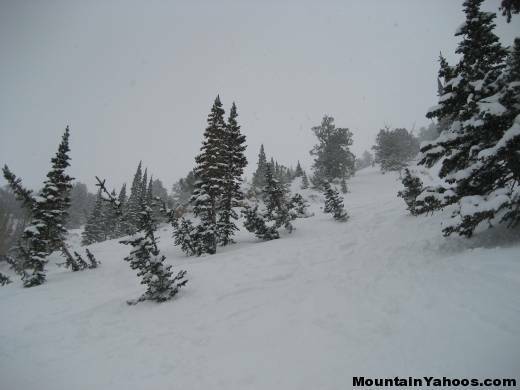 The MountainYahoos crew were blessed with almost a foot of powder on this visit and the skiing was as good as it can be. As mentioned, snowbird is definitely a resort expert skiers will enjoy. There are a number of green and blue trails, but it appears that Snowbird ranks most trails conservatively. Having said this, even beginners will enjoy skiing Snowbird and may look forward to skiing the more difficult terrain as well. 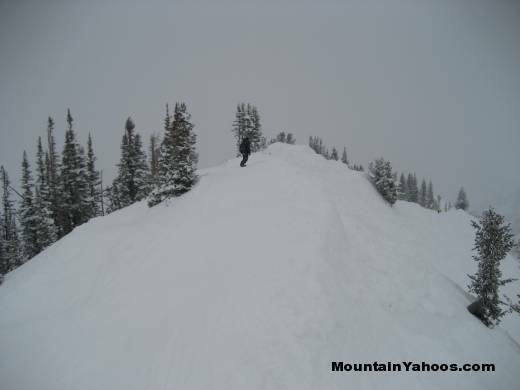 The mountain terrain is divided into the front face and back bowl known as Mineral Basin. Each has two lift accessible peaks. The Wilbere and Baby Thunder lifts service green trails at the bottom of the mountain. The Gadzoom High-speed Quad take you to the Bassackwards trail, which is an enjoyable blue trail. For more challenging terrain, take the tram to the peak and ski down Chip's Run (blue trail). The ride up the tram can be a little intimidating for first timers, but the views on top of Hidden Peak at 11,000 feet are nothing short of spectacular. 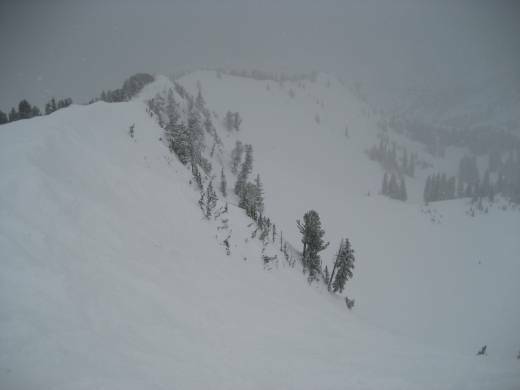 The Mineral Basin (back bowl) is on the other side of the front face of the main mountain and is most easily accessed by the Tram from Snowbird Center. If you don't want to spend the extra $10 to take the Tram, Mineral Basin can also be accessed from the Peruvian Express lift via a neat conveyor belt that take you through the mountain to the other side. This is also an experience in itself. 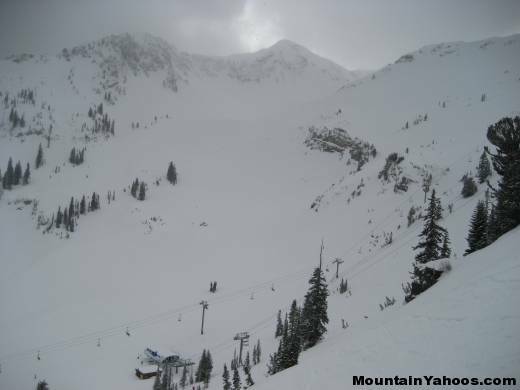 It's also possible to access the Mineral Basin from Alta (adjacent ski resort) with the appropriate pass. Once in the Mineral Basin, a wide open bowl awaits skiers/boarders with everything from green trails to double diamond trails. This is the place to visit first on powder days! There are only two lifts servicing the basin, but the lift lines are surprisingly small. The day MountainYahoos visited, we were almost the only ones and lines were non-existent. Also check out the Gad Valley by taking the tram to the peak and follow Road to Provo. 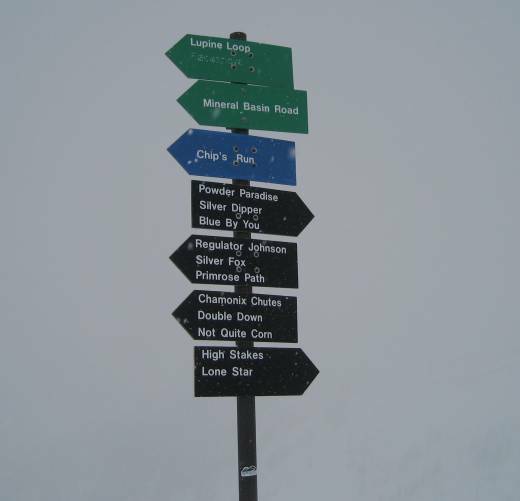 The top of Hidden Peak gives you many choices including Mineral Basin or a route to the base lodge. For the expert skiers, there is a lot of terrain to choose from, and few will ever get bored of skiing Snowbird. 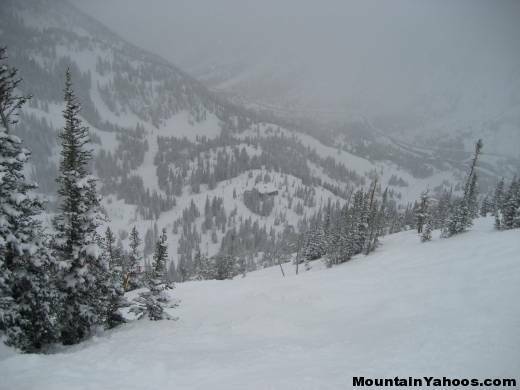 The two main areas to check out for expert skiers are the Mineral Basin and off the Cirque Traverse (under the Tram). 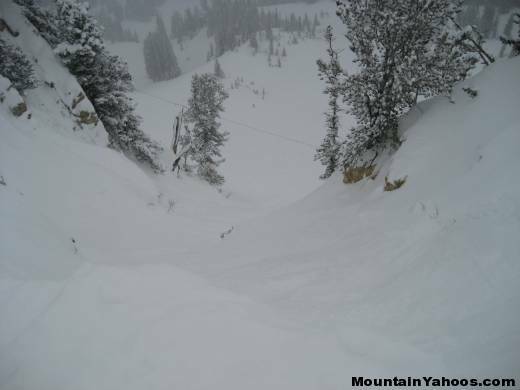 The most difficult terrain in the Mineral Basin bowl can be found by traversing right when getting off the Tram. The further you traverse, the steeper it gets. For even more difficult terrain, take the Cirque Traverse from the tram (towards the main base). The trails are poorly marked here so don't expect to see signs, but it doesn't really matter since there are so many steep trails. The steepest ones will be on the skier's right side (Upper, Middle, and Lower Cirque). For slightly easier terrain, keep skiing the Cirque Traverse and ski down either Barry Barry Steep, Wilbere Bowl, or Wilbere Chute to the left. Either of these runs at the Mineral Basin are good choices for moderate steep terrain. For even steeper terrain, keep traversing around the Mineral Basin. This trail on the skier's right while skiing down the Cirque Traverse had no explicit sign but it is know as "The Elevator". Run: Tree run next to "Gadzooks"
There are a lot of good tree skiing at Snowbird, but the best trails can be found by taking the tram to the peak and then follow Cirque Traverse to either Gad Chutes. 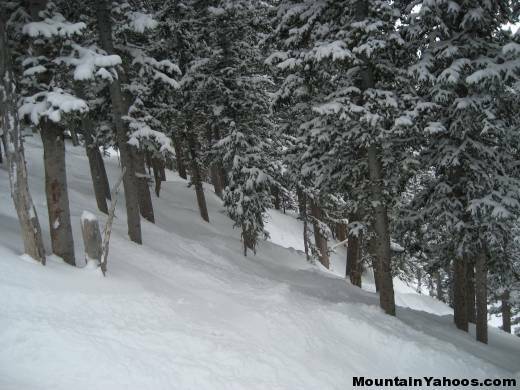 There are also some nice tree runs next to the Gadzooks trail (take the Gad 2 lift to get there). The day the MountainYahoos crew visited, we didn't find a lot of mogul runs due to the recent snowfall (we were not complaining!). The Gadzooks trail, accessed from the Gad 2 lift, was the best mogul run of the day. There are also some nice tree skiing off of Gadzooks. There is one terrain park is located on the lower part of the Big Emma run under the Mid-Gad lift. Apres ski is very limited and often affected by Utah's private club rules. This stipulates that people must become a member of the bar before one can enter and consume alcohol. The good news is that anyone can join. This is the loophole used to get around Utah's conservative Mormon bar laws. The Utah bar laws are to be revised in the summer of 2009, after which these laws should be similar to most states and the "private club" rule should no longer be required. The base lodge is the main social gathering point but there is limited action. For a great view, head to the Aerie Lounge and Sushi Bar on the 10th floor of the Cliff lodge. The Tram club (under the tram) is a sports bar with billiards, fooseball and video games. The mountain base has a few nice restaurants: Aerie, The Steak Pit, El Chanate (Mexican), The Wildflower and Rendezvous. Snowbird is located in a narrow valley and thus does not have the space for a base village or ski town. Your best shopping venue is Park City. Not much. Same options as Apres ski, head over to Park City or Salt Lake City. There are four slope side lodges – the Cliff Lodge, Lodge at Snowbird, The Inn and Iron Blosam for a total of 882 rooms.